What Is the Best Diet After Liposuction? Home » Aesthetic News » Liposuction » What Is the Best Diet After Liposuction? Liposuction is one of the safest and most effective body contouring methods, giving you a sleeker and more streamlined appearance by eliminating localized pockets of fat from problem areas. However, there is a common misconception about this procedure: that fat removed in the process can never return. Fortunately, maintaining the results of a liposuction surgery is as easy as choosing the right diet and making other small tweaks to your lifestyle. 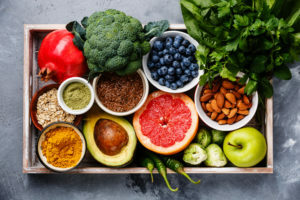 Although adhering to a strict diet after a liposuction in NYC is unnecessary, there are certainly foods that can negatively impact the results of the procedure, if not enjoyed in moderation. Heavily processed and and frozen foods should be eliminated as much as possible from your everyday food choices, as well as sugary beverages such as soda and fruit drink. Sugars, simple carbohydrates, and saturated fats are other food groups that should be minimized in your diet during the recovery process. Animal fats are particularly counterproductive to lasting results, and so intake of pork, beef, poultry with skin, and dairy products such as milk and cheese should be carefully monitored after liposuction. In order to achieve the most sustainable results from a liposuction, focusing on permanent additions to your diet is much more reliable than experimenting with a short-term crash diet. Reliable strategies for more balanced mealtimes include replacing a portion of the meat you eat with starches and proteins such as rice or beans. Vegetables should be another point of emphasis in your post-liposuction diet, delivering the vitamins and minerals your body needs for the fastest recovery possible. Whole grains can help increase your metabolism to give the results of your liposuction a critical boost, and sweet, snackable fruits such as grapes and strawberries can work wonders to calm junk food cravings. Another easy lifestyle change that can help you get the most from a liposuction procedure is to break up large meals into smaller servings and eating them throughout the day. Doing this can help to increase your metabolism even further, burning calories at a higher rate to guard against the reappearance of fat pockets as well as preventing hunger pangs that can lead to unhealthy food choices. A good target meal structure is to eat 5-7 snacks and small meals per day instead of 2 or 3 larger ones, particularly when you choose the right foods. Drinking water not only provides direct benefits for your body such as clearer skin and more efficient digestion, but can help control hunger as well. Liposuction patients should aim to drink about half their weight in ounces of water daily. For example, a 150 pound person should try to drink at least 75 ounces of water on a daily basis. Keeping properly hydrated is an easy way to maintain the results of the procedure as well as improving your overall health. Liposuction is a powerful tool for body reshaping, but it is not a magic trick. Along with other lifestyle initiatives such as regular exercise and an appropriate amount of sleep, the right diet can ensure you maintain your newly sculpted shape for years to come. Call the offices of Thomas Loeb today to learn more about redefining your body, and view liposuction before and after NYC photos. If you have stubborn problem areas that just won’t respond to diet and exercise, liposuction in Manhattan might be the answer. Call the offices of Dr. Thomas Loeb for a consultation.